Jumping rope is a familiar exercise to most boxers. Jumping rope will raise your core temperature, elevate your heart and breathing rate and get you ready for more strenuous warm-up exercises to follow. Start jumping rope with your feet together before progressing on to an alternating heel to toe action and running on the spot with high knees. Finish off by two rope turns per jump—an exercise called double unders. 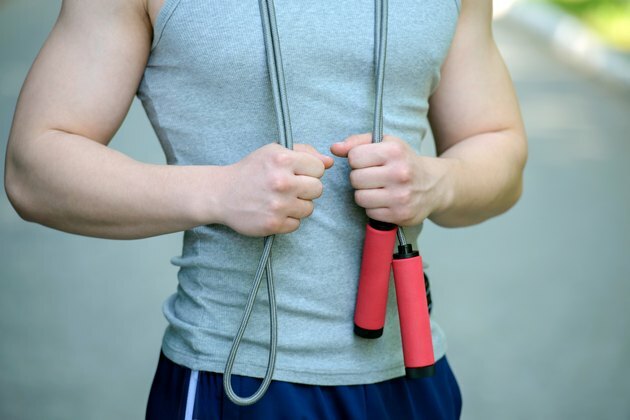 Continue jumping rope for five to 10 minutes before moving on to the next part of your warm-up. Stand with your feet together and your hands by your sides. Imagine there is a hip-high barrier immediately to your left. Raise your left leg and step over the imaginary barrier and immediately follow with your right leg. Next, move to your right and duck under the barrier. Try to get as low to the ground as you can and duck your head. Repeat this over/under maneuver for five to 10 reps before reversing direction. Shadow boxing provides you with the opportunity to practice your boxing skills before throwing any punches against an opponent. Start off by throwing single jabs and crosses before adding hooks and uppercuts, building up to throwing multiple punch combinations. Practice your footwork while throwing combinations as though you were attacking, evading and counter-punching a real opponent. Try to increase the speed of your punches.